What is the difference between monochrome, black and white, and grayscale? The three terms are often used interchangeably, but there are technical differences. A monochrome image consists of a single color of varying intensity against a neutral background. 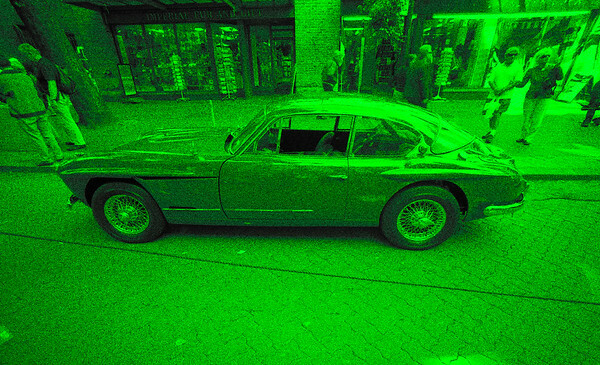 For example, night vision cameras use varying levels of green. The definition of neutral background depends on the medium. On a computer monitor the background color is black. A red monochrome image will have black shadows and red highlights. On paper the background color is white. A red monochrome image will have red shadows and white highlights. A red and black image on paper is technically called duotone, because it requires two inks, red and black, to print the image. A black and white image is a type of monochrome image, one that uses black and white. The definition works for both computer monitors (levels of white on a black background) and paper prints (levels of black on a white background). All black and white images are monochrome, but not all monochrome images are black and white (see the red example above). 1. A grayscale image is the same as a black and white image. 2. Grayscale is a method of storing and representing black and white images on a computer. In Photoshop this is called a mode. A mode in Photoshop is a way to store and represent color information. Modes have different origins and uses. For example, RGB mode (Red/Green/Blue) originated in color film industry and is based on the colors of filters used in processes like Technicolor. It was also used in color television to represent the intensity of red, green, and blue dots on color tv (and later computer monitors). CMYK mode (Cyan/Magenta/Yellow/Black) originated in the printing industry and represents colors of ink. A grayscale image, like black and white film, only records the intensity, not the color of the image. In that sense grayscale images are the same as black and white images. Grayscale images can be stored and represented in RGB, CMYK or any other mode. Grayscale images can also be stored in it’s own native grayscale mode. "Wait, didn't I see this page on blackandwhitedigital.com? Why is it here?" After 12 years maintaining blackandwhitedigital.com I've decided to move the contents to my gallery site.